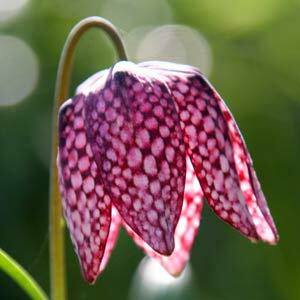 Fritillaria, are one of the most enchanting bulbs you can grow, the well known ‘Snakes Head Fritillaria’, or Fritillaria meleagris is probably the easiest to grow, and it is fascinating, with its chequered drooping flowerhead in spring it will make a show. These are a spring flowering bulb that grow well in the garden as well as in containers. Some varieties are very easy to grow and will naturalise into the garden border. Others are a little more demanding in terms of growing conditions. The flowers are unusual as well as colourful, mostly pendulous and bell shaped. All varieties grow well in full sun to part shade and most require a well drained soil. With dozens of species, the world of Fritillaria has a lot to offer. From small delicate flowers to large impressive types, colours vary as well, even the popular ‘Snakes Head Frit’ comes in a white form as well as the purple type. If you are patient try growing Fritillaria imperialis, this is the crown prince of fritillaria up to 1.5m with orange or yellow ‘Maxima Lutea’ drooping bell shaped flowers from the top of its tall stem. Other popular species include F.uva vulpis and F.persica, like all species the best time plant these bulbs is in autumn. Grow them in containers and they will be happy as long as you keep the moisture up through spring and do not let the soil dry out completely in summer to autumn after they have died back. We do prefer to grow them in the garden and have even naturalised them into the lawn. Clumps can be divided after the foliage has died back, or you can wait until late winter if you wish. Sometimes the species are lumped together as frost hardy easy care bulbs. With species from North America, Europe and Asia, they are in fact varied in cultivation requirements.